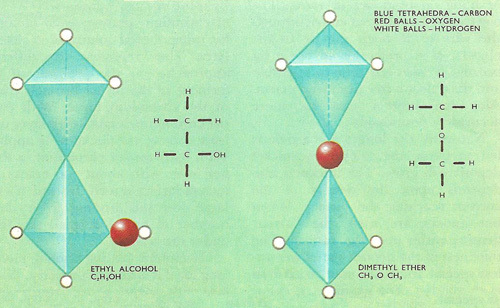 The structural isomers ethanol (ethyl alcohol, left) and dimethyl ether (right). Structural isomers are compounds whose molecules contain the same number of type of atoms but have them arranged in different functional groups or have their groups attached to different carbon atoms in the carbon chain. Ethanol and dimethyl ether are a pair of structural isomers. The molecules of both substances contain 6 atoms of hydrogen, two or carbon, and only one of oxygen, but these atoms are arranged in different ways in the two compounds. In ethanol the oxygen atom forms forms part of a hydroxyl (–OH) group attached to an ethyl (C2H5–) chain, while in dimethyl ether the oxygen atoms acts as the link between two methyl (CH3–) groups. As a consequence, the two substances have different chemical as well as physical properties. The other main type of isomerism, which involves stereoisomers, is when compounds have the same atoms and groups attached to the same carbon atoms.